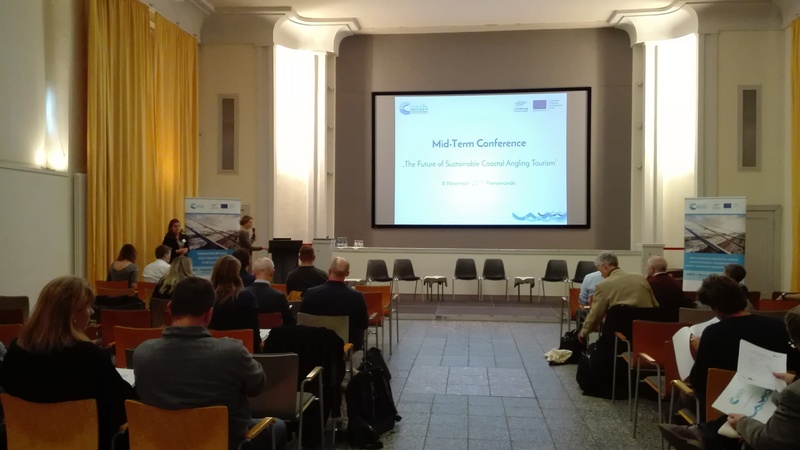 On November 8, 2017 the Mid-Term Conference “The Future of Sustainable Coastal Angling Tourism” was held in Peenemunde, Germany. The conference gathered participants representing fishing, tourism, authorities, scientific and non-governmental organisations. Gerd Lange, Head of Tourism Unit at the Ministryr of Economics, Employment and Health Mecklenburg-Vorpommern and Policy Area Coordinator Tourism in the framework of the EU Strategy for the Baltic Sea Region welcomed the participants. The discussion was moderated by Arnulf Ehrchen, Former deputy editor – in-chief “Rute & Rolle”. During the lunch break a guided round tour at the Mola Beach Angling Camp (Peninsula Peenemünde) was offered. Both the presentations of invited speakers and exchange of participants as well as questions of the conference participants turned out to be very fruitful and relevant. They allowed them to get acquainted with the subject of fishing tourism in the area ofthe southern Baltic Sea as well as to explore and refine the knowledge of the subject matter. Moreover, the conference allowed for comparison of different approaches, shortcomings and strengths in approach and treatment of the angling and tourism sector in Denmark, Germany, Poland, Lithuania and Sweden as well. Recreational fisheries combined with active tourism is a significant element of coastal development. The potential for expansion of this area can and should go hand in hand with an ecological, sustainable approach connected with the conservation of attractive angling fish stocks as well as their characteristic habitats. The project CATCH aims at emphasizing the importance of recreational angling in the South Baltic, increasing the capability of coastal communities to establish sustainable angling tour-ism, delivering improved measures for touristic providers and combining all new knowledge in an information and knowledge platform on coastal angling tourism.